The Shoebill is a very large bird that is often confused with the stork. While the bird is a different species than the stork, it is related to it. 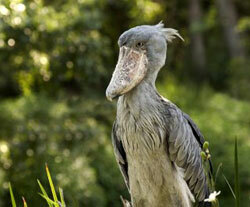 Also known as a Whalehead, the Shoebill measures about four feet tall and usually weighs more than 12 pounds! The birds are generally grey and white when they are adults though the younger juvenile birds are browner in appearance. This bird was first seen in the 19th century when the skins of the birds were brought to Europe, which sparked the interest of the scientific community. Though they were not known to Europeans until then Egyptians and Arabs were very familiar with the bird, in fact Arabs know the bird as the abu markub, which means one with a shoe, which refers to the bill of the bird. The Shoebill has the distinction as being known as the number one ugliest creature on the earth, according to the Beastly Countdown on Animal Planet. 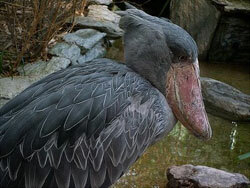 The Shoebill is native to the tropics of east Africa and is also found in the swamp regions of Sudan as well as Zambia. 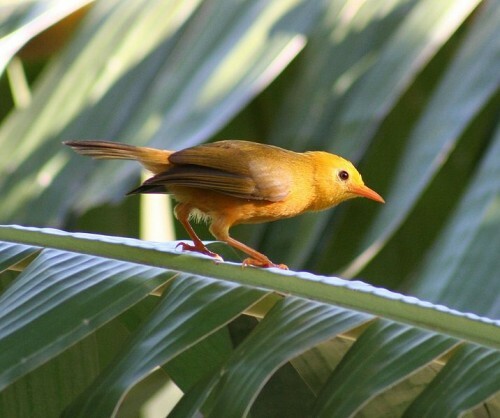 The bird is currently considered as a vulnerable species by BirdLife International due to the fact that the natural habitat of the bird is being destroyed by modernization of many areas as well as hunting of the species. Despite the vulnerable status, it is estimated that there are somewhere between 5,000 to 8,000 individuals alive and well, most of which are located in Sudan. 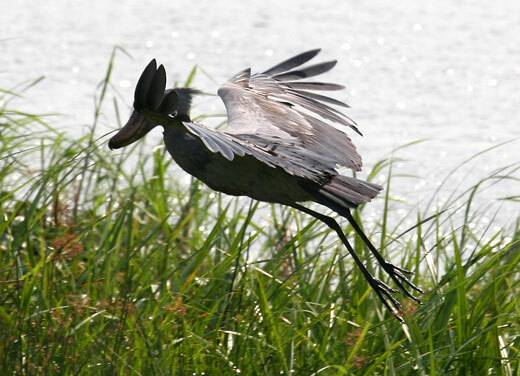 The diet of the Shoebill is usually items that can be found in the water. The species likes to hunt in muddy and murky waters and favors fish such as lungfish and other fish like it. The birds usually simply stand in the waters and wait for something to cross their path, though they are also known to walk very slowly through the murky waters with their bill in the water. The birds have been seen with their bills in the water for as long as 30 minutes while they wait for something to come along. When the Shoebill finally sees something that they want they simply thrust their body forward and they grab it with their distinctive bill. The Shoebill usually is part of a monogamous pair and they make their nests of vegetation that is found near swamps or other sources of water. Many times the nests are built in the swamp and the bird pair must rebuild constantly to battle against sinking. Other times the nest is built in the mud away from the swamp. The female usually lays two white eggs that measure about three inches by two inches and weigh about six ounces. The eggs are laid in intervals of up to five days and then they incubate for 30 days. Once hatched, the babies stay in the nest for 105 days and by the time they are 95 days old they have feathers and will begin to wander out of the nest and by 105 days they start to fly. Both the male and the female tend to the young while they are still in the nest. I found this site very informative. It gave me all the information I needed for my project. it is great site for all the people who love nature and want to know about the animals and birds bcuz im not doing any course related work, but i love to read about animals.